Thanks to Dulcinea’s whining about McClintock, I pulled good ole “GW” out of the John Wayne stack of DVDs and watched it. Again. There is a lot to like about the movie although I’ve noticed the trend in his movies is to be rough with his leading ladies. He “takes” his women, and I’m not a fan of that. At. All. I never objected to a spontaneous or “stolen” kiss, but I don’t like the forceful grabs and the spanking. Really? Spanking a grown woman? Pointing out that Maureen O’Hara took a pretty good swing at him doesn’t make it right. Still, there is much to enjoy about the movie. For starters, I love Maureen O’Hara almost as much as I love Yvonne de Carlo, and both of these great actors are in the movie. But here’s what I really like about McClintock: it defends the sacred bonds of marriage. It really does defend the intimate relationship between a man and a woman in marriage, and I’m not talking about the obvious, you sillies, I’m talking about the intimacy that happens from experiencing life together…what happens when people make a commitment and keep it. McClintock (Wayne) and his wife Kate (O’Hara) are living apart. When their daughter asks him about their separation, and then makes a disparaging remark about her mother, his wife, he tells his daughter that it is none of her business. He explains to her that she has no idea about the things they experienced in their marriage and how those events, so far in the past, serve not just as a foundation, but the grounding of their relationship through sacrifice and commitment. Whatever has driven them apart, temporarily, cannot surpass the depth of the experiences that bind them together. Then he shares his wish that some day his daughter should need to face the hardships of life, as well as the joys, with a husband by her side so that she may understand. There is a riotous reconciliation at the end (and another ridiculous spanking) but on the way to the finale we see the steps leading to forgiveness, and the tenderness of an intimacy that comes from years together. Blame my “whining” — here’s more. It took us THREE NIGHTS to finish watching it after I originally tweeted. We finished last night (after you were long done). you need to see the video john posted on my fb wall. 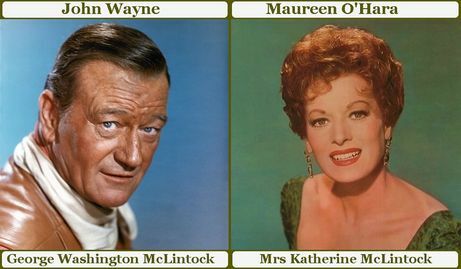 If you enjoy “McLintock” you will enjoy visiting Maureen O’Hara’s official site which I design and edit. Just Google “Maureen O’Hara Magazine” and scroll down a bit and you’ll find a special section on Maureen O’Hara and John Wayne and also a page dedicated to the movie “McLintock.” I speak with Maureen several times a week (she lives in Ireland now) and keep current with what’s happening in her life. “McLintock” remains one of her most popular films. Excellent review. Now I’m going to have to add some John Wayne movies to my Netflix queue.